There’s something about the name of a football team that can evoke a certain image in the mind’s eye, though inevitably that image is usually crushed when a visit is paid to that side’s home ground. Queen of the South brings up pictures of Palmerston Park having plush, regal surroundings, while Leyton Orient points to some exciting east Asian area of London, perhaps with a replica Forbidden Palace to attract the tourists. Created from a merger of the equally originally-named Albion FC and Rovers FC, Albion Rovers mix two team-name endings to describe not an awful lot. Coatbridge-based, the North Lanarkshire behemoths have one Scottish Cup final appearance to their name (from 1920) and were a top tier side in Scotland for much of the 1930s. However, they’ve had not an awful lot of success since, presumably not helped by the fact they might as well be called “United City” or “Town Athletic”. Like Bobby Williamson and James McAvoy, this post takes an unlikely trip to Uganda next. Uganda Revenue Authority are one of a number of African sides born from government departments (as the name subtly hints). The URA (as they are undoubtedly known) have won their league title 4 times in recent years (with Kampala City Council FC winning a mere 1 in the same timeframe in the battle of the Ugandan public sector), and were sadly knocked out of the African Champions League this season in the preliminary round by Coton Sport of Cameroon. They may consider a mighty cross-Africa public sector merger with my next uninspiring team candidate to go for a major assault on the Champions League next season. Representing the prison officers of Lesotho (a land-locked country surrounded entirely by South Africa), LCS is one of that nation’s more successful clubs of the last decade. The club has won 6 titles since the start of the millennium, two of those with the slightly less politically correct moniker of Lesotho Prisons Service. LCS too were knocked out in the preliminary round of this year’s African Champions League, by Dynamos of Zimbabwe (who, coincidentally, together with their arch-rivals Tornados, are the subject of a 13-minutes long song by the Real Sounds of Africa). One only hopes that the players of LSC don’t take their frustrations in losing to the Zimbabweans out on the in-mates of the Maseru Penitentiary. To the north of Africa now (Egypt, specifically) and two teams named this time for the companies that own them. Suez Cement are a cement company based in, er, Suez, while Arab Contractors is a construction company based in Nasr City in Cairo. For a further originality bonus, Arab Contractors play in the Arab Contractors Stadium, a 35,000 capacity beast. AC are by far the more successful of the two sides (there are other clubs in Egypt with equally mediocre engineering company-based names), currently playing in the Egyptian Premier League and with one title (from 1983) to their name. Cement, meanwhile, have been going round in Blue Circles between the Second Division and the Premier League, though for a club only founded in 1995 this is pretty good going. Africa just keeps giving up terrible team names and another of those is the beautifully-monikered Missile FC. Based in the capital city of Gabon (Libreville), they’ve been with us since 2003. Accolades include a single Gabonese title in 2011, followed by an unfortunately swift exit from the African Champions League (sponsored, as everything in African football seems to be, by Orange). They currently find themselves in mid-table in this season’s Championnat National, fourteen points off top spot. Perhaps we need more teams to be named after items of weaponry to further inspire support. Our final stop in Africa sees a visit to Blantyre, the second largest city in Malawi and home to the biggest club in that country, Big Bullets. Whether or not the Big Bullets are as big as a Missile is unclear – it depends just how big they are; what is clear is that, in a Malawian context anyway, Big Bullets (or “BB”) are pretty good. Their derbies with the better-named Mighty Wanderers attract tens of thousands of supporters to the somewhat rickety Kamuzu Stadium, while their 11 TNM Super League title wins are unsurpassed in their home nation. Slightly impressively for a side from a small country in African football terms, BB have been to an African Champions League group stage in 2004, beating South African giants Orlando Pirates on away goals on the way there, though they then failed fairly miserably in a group containing eventual champions Enyimba of Nigeria. The years since then have offered fairly slim pickings (Arsenal fans should be able to empathise here) – BB have, unfortunately, won nothing since 2005 (the league having been mostly dominated by Silver Strikers from the capital city Lilongwe), primarily due to financial issues. With a fanbase of an estimated 3 million people in a country with a population of 14 million, one would hope they find their way again and that soon. One place I was sure I would find an uninspiring team name was a communist country, and it was in Laos in east Asia that I hit my next target. Information on Laotian football is sadly thin on the ground; I know FDFC (as they are surely known) play in the capital city Vientiane, in the New Laos National Stadium which is shared with 6 other sides, and they lost 4-0 at home two weeks ago to HA-Attapeu. How a club gets a name like Friends Development is not entirely clear – it’s surely safe to make the assumption that they’re a bunch of very friendly guys, and are probably pretty good losers to boot. Though not exactly evoking much fervour and spirit in their supporters (which is possibly entirely the point). To somewhere rather more exotic (and unstable) now – Fiji. Ba FC are from the town of Ba, which seemingly has a big football in the middle of it to celebrate the town’s connection with its pretty successful football side. What I find uninspiring about this side’s name is – you have a town with a very short name – surely what you want to do is jazz up the name a little bit with a “United” or “Town” just to make it sound like a football team. But no, “Ba” it is (which must be the shortest name for a football club in the world, though there may be some one-letterers out there). Like Big Bullets, Ba are a bit of a local powerhouse, winning the fantastically named “Battle of the Giants” fifteen times, the Fijian National League 18 times and, most notably, being beaten OFC (Oceania) Champions League finalists in 2007 (to, inevitably, Waitakere United of New Zealand). Ba are occasionally quoted as “4R Electrical Ba” (4R Electrical being a sponsor) which kind of makes them sound like a mild form of animal torture, and is probably a slightly more terrible name than just “Ba”. Still, more imagination needed, Fiji. We end this bizarre round the world trip in a perfect location – Barbados. No, not in the under-21 leagues of Italy, but Barbados. Youth Milan is a side based in Checker Hall (not Milan) in Barbados – why on earth they are called Youth Milan is not entirely clear given the Caribbean is a long way from Italy. Milan have two Barbadian titles to their name, from 2006 and 2011 and are coincidentally sponsored by a cement company, Arawak Cement. These cement companies have a lot to answer for. So there ends my tour of bizarre and fundamentally uninspiring team names – names that appear to evoke little or no connection in the supporter – unless you really, really like cement or weaponry. If anyone else has any good team names to share, please do so in the comments box. 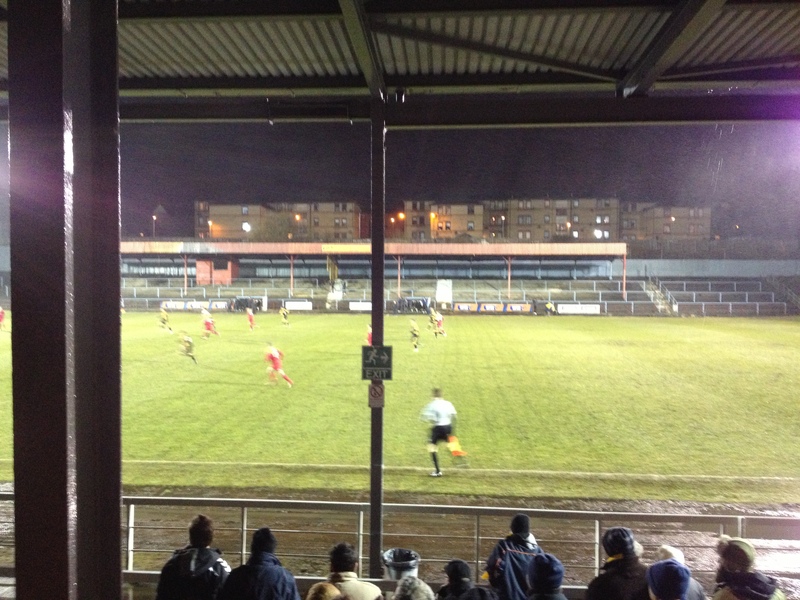 It was a decision made on a whim, but my fifth East Fife game of the season saw me travel to Coatbridge. This was the first match of East Fife’s relegation-avoidance double-header (the second being Stranraer at Bayview on Saturday, weather permitting). As the train trundled its way from Edinburgh (no snow) through Livingston (lots of snow) I was getting a tad concerned about Scotrail’s ability to get me home after the match. Nevertheless, having arrived at Coatdyke station (no snow) and voyaged for 15 minutes into the heart of Coatbridge via a local Chinese takeaway, I took my seat in the main (and only) stand at Cliftonhill, home of “the Wee Rovers.” And what a home it is. This being my first visit, I took the chance to get a feel for my surroundings. Only the main stand is accessible to supporters (with no segregation); another good-sized bit of terracing across the far side looked at us forlornly, and empty, throughout the match. The two ends are devoid of any structure, though last night they were occupied by a couple of parked cars (a Ford Focus and a Fiesta if I remember correctly). The main stand itself was also some creature. There’s a bit of standing space at the front, with stairs at the side leading to a tiny wooden (yes, wooden) grandstand. 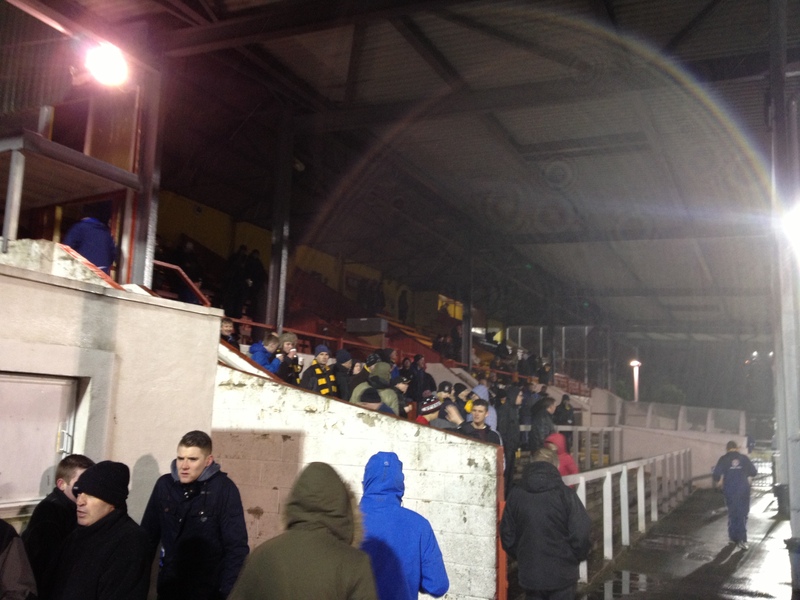 At the East Fife end, it was pretty much (other than the roof) entirely open to the elements, which led to rather a chilly evening for all concerned as the wind found its way through the various gaps in the structure. To the game itself, the gale-force winds and driving snow did not make for the most attractive match though both sides put in no little effort in the difficult conditions. East Fife seemed to make the most of the opening 15 minutes without producing anything clear-cut, before a shoddy backpass almost let in Rovers’ Pat Walker for the opener. Luckily, his finish, skidding wide of the mercifully returned Michael Brown’s right-hand post, was as good as the backpass. The home team then grew into the game, keeping possession for a long spell midway through the half and it wasn’t a huge surprise when they took the lead on 31 minutes. Christopher Dallas was the man who got the vital touch as the ball dribbled irritatingly into the net at Brown’s far post. 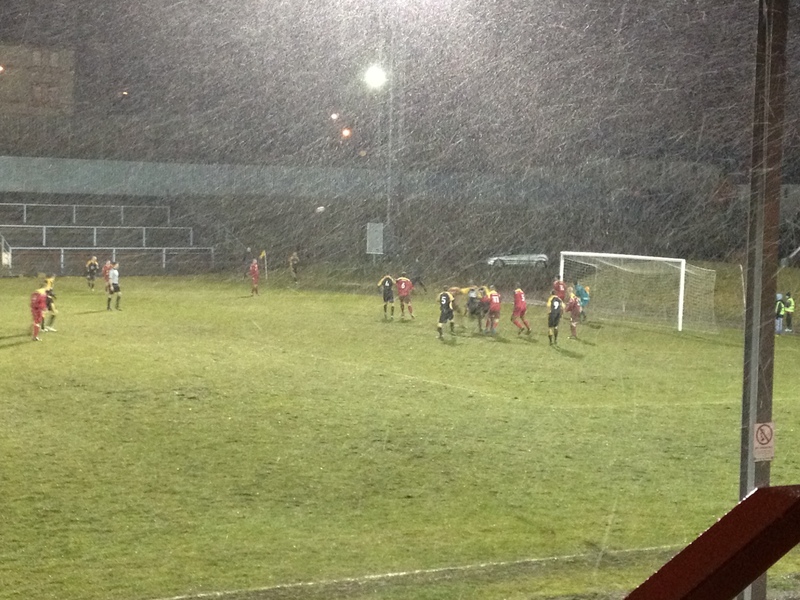 Rovers then forced a good save from Michael Brown a few minutes later with the men from Methil’s equaliser looking as likely as the snow stopping. However, enter Paul Willis, who a couple of minutes from time with the wind at his back smashed a 30-yard rasper into the top-corner past Ryan Scully in the Albion goal. 1-1, and I’ve not seen as good an East Fife goal as that in a long, long time. With the score 1-1 at the end of the first 45 minutes, it was time to sample some of the local Bovril (decent), listen to the rubbish music played over the public address system (the A-Team – geddit?) before settling in for another wintry three quarters of an hour of Scottish Second Division football. The start of the second half saw Albion change their keeper, with Matthew McGinley replacing Scully. The fact Mr McGinley won the man of the match award tells its own story as he made a series of fine saves in the second period to keep the score at 1 each. Firstly he clawed out a David White diving header from a near-side corner. He then, after Paul McManus had (too) unselfishly squared from his run through on goal for Bobby Barr to finish, kept the resulting shot out. His best moment came 15 minutes from time, tipping a looping Barr effort over the, er, bar when it looked like the ball might just dip into the top corner. The Fife’s last real chance came five minutes from the end – McManus though was unable to finish from a tricky angle, and the match drifted to a conclusion with both sides seemingly content with a point for their night’s work. A second half corner for the chaps in black and gold. Some snow also. The referee’s whistle signalled an end to East Fife’s run of defeats, though puts more pressure on Saturday’s match at home to Stranraer – however a win will still see the men from Methil move into 8th in the table. As it was, the 206 hardy souls in attendance made their way home not entirely satisfied, but having seen a game played in a good spirit in pretty awful conditions. And for the record, Scotrail did get me though home, though with a cancellation and a delay they did try their best to make me stay the night in Coatbridge.